Life keeps throwing up nice surprises for Jacob Stockdale, the 21-year-old Ireland wing who can’t stop scoring tries. Uncapped a year ago, he has now scored 11 tries in nine Tests and the record seven he got in the recent NatWest 6 Nations have seen him crowned as the 2018 Player of the Tournament. Stockdale, whose seven tries eclipsed the six tries set by Chris Ashton, Will Greenwood and Shane Williams in previous championships, secured 32% of rugby fans’ votes – a higher percentage than Scotland’s Stuart Hogg achieved in winning the accolade in 2016 and 2017. Grand Slam winners Ireland occupied the first four places in the vote, as Conor Murray (18.2%), Johnny Sexton (18%) and Keith Earls (14.5%) were next on the list. Italy full-back Matteo Minozzi earned a creditable 13.2% for the wooden spoonists and France captain Guilhem Guirado completed the line-up with 4.1%. Stockdale said: “It’s been a truly memorable few weeks, making my first NatWest 6 Nations appearance, winning the championship and then going on to complete the Grand Slam against England. Breaking the try-scoring record was the cherry on top! Everyone thinks I was born in Lisburn as I went to school there. But I was born in a wee town called Newtonstewart. My dad (Graham) was a minister so we moved about a bit when I was younger. Dad became a chaplain and works part-time in a prison and part-time in a hospice. My mum (Janine) was a midwife. I was destined to play rugby. Dad and granddad played all the way through school and then club rugby. I was four when I first got involved, with Ballynahinch mini rugby, and I played there until I went to secondary school (Wallace HS). I loved it and have done ever since. My first memory of Ulster rugby was when Dad took me to a game at Munster. We were in the car so long I thought we were going to Wales. I remember not being able to distinguish between the Munster and the Ulster chants. I was singing along with all the Munster fans! Jonah Lomu was the guy everybody wanted to be. Jonah was a freak and my favourite player growing up. From an Ulster perspective I remember David Humphreys, and Tommy Bowe and Andrew Trimble as well – those were two guys who everybody at school looked up to it. It’s quite surreal training and playing alongside them now. I was a late developer. At 15 I was 5ft 5in but when I hit 16, 17 I shot up. I never envisaged having a rugby career – I was just this scrawny guy and it was ridiculous to think that could happen. In my fifth year I was playing for the thirds and fourths but I got a bit of size and a year and a half later I was playing for Irish Schools. I haven’t given up on centre. At the moment I look at myself as a back-three player but if opportunities arise and Ulster want me to play in the centre, that’s a challenge I’d be quite keen on. I played 13 in the upper sixth. My Ireland debut in June was a phenomenal experience. It was against USA in New Jersey (won 55-19). It wasn’t as difficult as I was expecting. It was warm but I felt my fitness stood up to the speed of the game. It didn’t take long to get into it because they put the kick-off right down my throat and I had to carry off it. There was no better way to start. For my try I just had to run it in. It was a brilliant break from Keith Earls, who was phenomenal on that tour. He threw a diamond of a pass into my hands and all I had to do was sprint it into the corner. I can’t take too much credit but it was pretty good either way. My parents weren’t able to be there unfortunately. They’ve been unbelievably supportive and come to every Ulster game I play and as many Irish games as they can. They were watching at home and all my cousins came; they’re an hour and a half away and they all came down and were going nuts. Pretty much the entire family, the dog and the cat, came to my home Test debut against South Africa and to get a try at the end was really special. My defence is something I’ve strengthened. 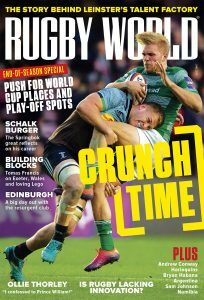 Joe Schmidt wants me to be more assertive defensively – know when to hit somebody and when to sit off and connect with my defenders and use the touchline. It’s not something you can just have automatically and Joe wants me to focus on learning that and not just skate by. But I do think it’s something I’ve improved. I’m a self-confessed rugby nerd. If there’s a game on I’ll definitely watch it. A lot of it is just for enjoyment’s sake, but if I see somebody do something outstanding or different, I store that away and think, ‘That might come in handy’. I’m really interested in Ultimate Fighting too. I live with three other Ulster players, Adam McBurney, Marcus Rea and Jack Regan. We got the UFC game for the PlayStation and that created an interest in watching real fights. And I like watching football – I’m a Chelsea fan. My dad is a Man Utd fan so I went as far opposite as I could! Ulster’s new coaching team has shaken things up. A big part of it is standards, what is being driven. The previous coaching team had been in place for so many seasons and there was maybe a little bit of complacency. Jono (Gibbes) and Dwayne (Peel) and Aaron (Dundon) have come in and given us a bit of a kick up the arse. Their impact has been really positive. It’s disappointing that Charles Piutau is leaving at the end of the season. He’s a brilliant talent and a great guy and I’ve loved playing with him. But as the same time you can’t think that way – every week you have to go out and play as well as you can. We want to win silverware and Charles doesn’t want to leave feeling like he could have given more. Charles and Christian Lealiifano have taught me to have a crack. To be more expressive in how I play. They have a very attacking mindset, always looking to break the line, get an offload away, be on the front foot. It’s exciting to learn off those guys and to be able to pick their brains about stuff. The defensive side is class too. Andrew Trimble, Tommy Bowe and Louis Ludik are some of the best wide defenders there are, and I enjoy working off them. You’d search far and wide to find a club with the back-three players that Ulster have. We have a real wealth and it’s brilliant in terms of the competition because you’re constantly having to be the best player you can be. They’re making me a better player every time I train with them. I’ve started a criminology degree. I tore my groin two seasons ago and was out for four months, so I thought I’d get an education. I went to University of Ulster at Jordanstown and really enjoyed it. I did my first semester but I was making my breakthrough into the Ulster squad and wanted to focus on my rugby, so had to give up the degree. That said, 100% I intend to go back to it, to get my degree for after rugby. I’ve always had an interest in why people commit crimes. The course looks at why people do it and the best way to stop them and how to deal with them. Does prison work or is it just a vicious cycle? That kind of thing. With my dad working in the prisons it did create an interest for me. I’d be interested in making a career of it after rugby, maybe on the policing side. I’ve just finished Mindhunter on Netflix, which is about an FBI agent in the 1960s who came up with the term ‘serial killer’. I’m a massive fan of Johnny Cash. At 15, 16 I fell in love with his music and the kind of person he was. He really interests me. I love Star Wars. It’s funny how I got into it; ITV were showing the entire series on a Sunday for six weeks. I watched the first one and thought it was class, so I went online and watched the other five over the next two days.